Aussie indie quartet, Howling Bells, return with a brand new album. 'Radio Wars, their sophomore effort (following their much-acclaimed debut, 'Into the Chaos' in 2006) , is due out on February 9th, and will be released on Independiente Records (home to the likes of Paul Weller Gomez and White Rose Movement). Their first single, 'Cities Burning Down', is scheduled for February 23rd, and is currently available for preview on their Myspace until then. 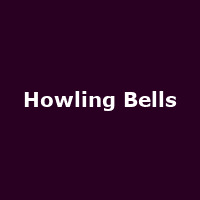 Howling Bells will play an album launch gig at the London Islington Academy on February 9th, before embarking on a full-on UK tour, kicking off on March 3rd in Bristol, via the cities of Southsea (March 4th), Norwich (March 9th) , Glasgow (March 11th),Aberdeen (March 13th), Manchester (March 16th), among others, and ending on March 16th at the Liverpool Academy 2. Tickets are on sale now and cost under a tenner, so no excuses, please!